My first piece has already been roughly cut out. The fabric stitch pattern is exactly where I want it. Now it's time to use that first piece, the front, to cut out the rest of the sweater. In this post I'm continuing from where I left things last time, responding to the questions regarding laying out pattern pieces on sweater knits. If you have any experience matching patterns with woven or printed designs, you can easily match up a bold texture or color jacquard in a sweater knit. 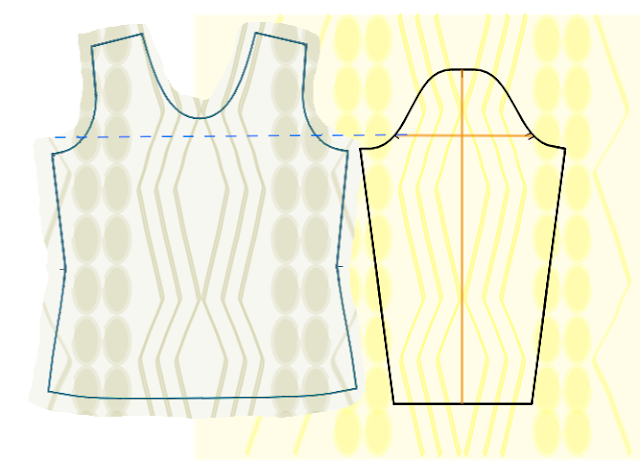 Every good basic sewing book gives instructions for matching patterns, and there are several sources on line. This is how I go about it. Some people think that it's more difficult to match sweater knits because the fabric is often less stable and stretchy. I say make the stretchy factor work for you; stretchy can be very forgiving. As with last time, I'm working with panels of fabric, and I'll use the already cut out front for matching up the first sleeve. 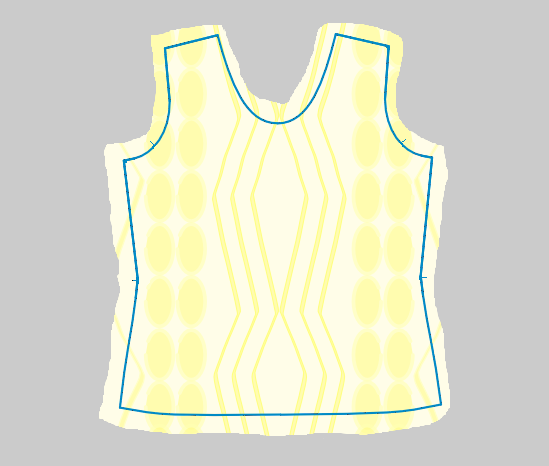 I'm working with a single thickness of fabric. And like last time, I start by marking the paper pattern. Step 1. 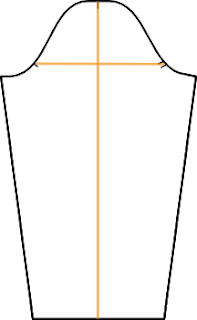 Using a marking ruler and pencil, draw a center line and a line perpendicular to the center line passing through the front notch on the paper pattern. Don't worry about the back notch, if any. Just make sure the lines are perpendicular. 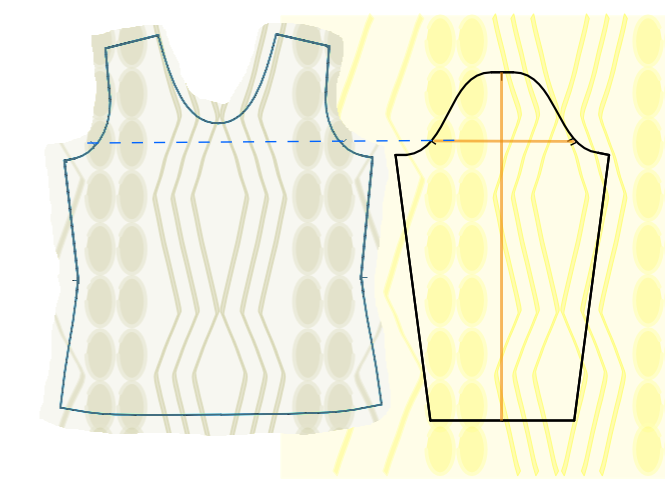 The vertical center line will help you get the sleeve squared up on the fabric. Once the paper sleeve is laid out on the fabric, the relationship between the sleeve and the already cut out front should look like this. Step 2. Using the front for reference, decide where to place the paper sleeve on the fabric. Perhaps the diamond motif will work well placed down the center line of the sleeve like the center line of the sweater front? Or maybe the columns of ovals would be best on the front of the sleeve? Then the layout would look like the one below. Since I thread traced the front on the sewing line (the solid cyan/turquoise line), I can use the line to help place the sleeve on the fabric with greater precision. If I hadn't thread traced, I could still get a pretty good idea by folding (and pinning) under the seam allowance of the front, wherever I needed to make a match. Step 3. Once placement of the sleeve is decided upon and squared up, weight or pin the paper pattern piece to the fabric, and trace the outline of the paper sleeve pattern using your favorite tailor's chalk or erasable fabric marker. If working without seam allowances on the paper pattern, you'll be marking the sewing line. Be sure to mark notches to the outside of the sewing line. 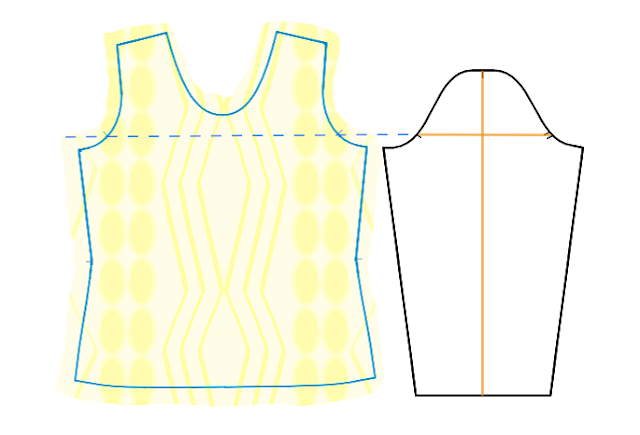 If working with a seam allowance on the paper pattern, you'll be marking the cutting line. Mark notches as you prefer, but never clip your notches to the inside with sweater knits! I think that tracing with a marker or chalk before cutting is the most important part! After removing the paper pattern, it's easy to examine your work to see if it's all ok before cutting out the sleeve. Hold the front next to the outlined sleeve and see if you really like the way they go together. Changes are easy. Chalk marks can usually be erased with a dry wash cloth. Lines made with erasable fabric markers can be removed with a damp wash cloth. (Always test markers and chalk on scrap fabric first. Let damp fabric dry before marking again.) Or you can simply use another color chalk or marker to make corrections. Step 4. Cut the sleeve out. Continue with the second sleeve and the back using the same procedure. I decided to go with the non-traditional layout for the final picture above. 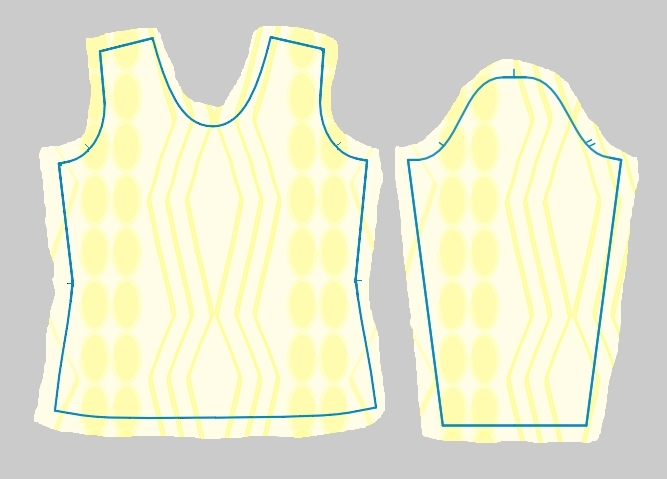 In reality, I've already cut out all my major pieces from the fisherman's knit panels using a rather traditional layout with the central motif... well... centered on front, back, and sleeves. This picture is to remind me to do something a little less traditional with the next sweater!